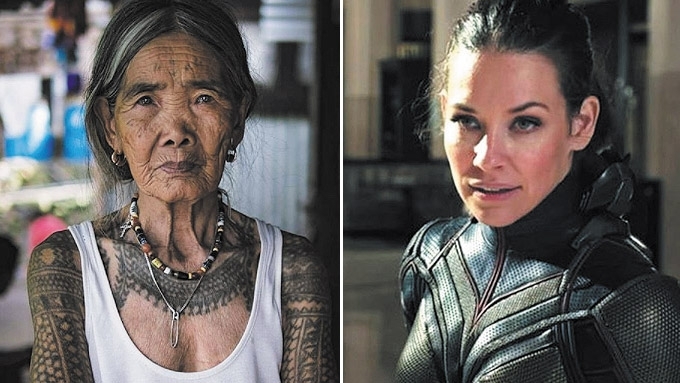 Filipino pride and Kalinga tattooist Whang Od (left) is revered for her skills as a tattoo artist by people from all walks of life, including Hollywood actress Evangeline Lilly. Hollywood actress and the star of the upcoming Marvel movie Ant-Man and the Wasp, Evangeline Lilly, honors Filipino pride Whang Od via Instagram. The 38-year-old actress shot to fame in the U.S. TV series Lost, which had a popular run from 2004 to 2010. In her IG post this Wednesday, March 14, Evangeline shows a photo and a sketch of Whang Od, with hashtags #beauty, #age, and #power. Whang Od is known as the oldest “mambabatok” or traditional tattoo artist in Kalinga. Whang-Od, now 101 years old, became known for batok, an old form of tattooing through hand-tapping. Her skills have been considered a national gem for keeping a Filipino tradition and culture alive. Meanwhile, the Philippines holds a special place in Evangeline’s heart because she went here and stayed in the island of Palawan for almost a month together with a missionary group. “When I was 18, I went to the Philippines for three weeks. I was on the island of Palawan and lived in the jungle with tribal people, which was incredible,” the Canadian-born actress was quoted as saying in an interview with Inquirer in February 2014. She also revealed in the interview that when she heard about the super-typhoon Yolanda that wreaked havoc particularly in Eastern Visayas back in 2013, Evangeline said that she got in touch with this specific Filipino fan via Facebook to ask how she was. “Thankfully, she wrote back to say, ‘Don’t worry, we’re OK,’” she said. Among the movies that Evangeline starred in were The Hurt Locker (2008), Real Steel (2011), The Hobbit film series, and Ant-Man (2015).